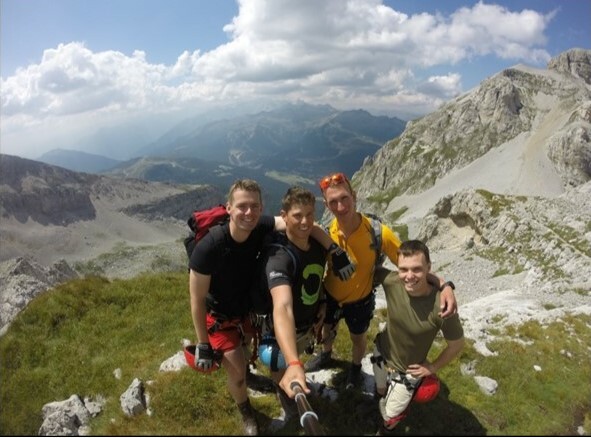 If Adventurous Training is intended to remove Officer Cadets from their comfort zone, challenge them physically and mentally, and ultimately help them to translate this experience into running AT for their soldiers when they reach the wider army, it is difficult to see Exercise BRENTA CADET as anything other than a huge success, and one which would not have been possible without the generous support of the Sandhurst Trust. On Friday 7th August, after their Intermediate Term had culminated in the Sovereign’s Parade, the Blues and Drill Boots were placed carefully away and four Officer Cadets from Ypres Company departed Sandhurst heading for the Brenta region of the Dolomites, in North Eastern Italy. After picking up their instructor, Major Steffan Wright MBE (Royal Engineers), from Carver Barracks in Essex, they continued down to Dover, and after just over one thousand miles of French, Austrian, German, and Italian roads they arrived just outside Madonna di Campaglio, the starting point for their via ferrata expedition. Only two of the five person party had even heard of ‘via ferrata’ six months previously (luckily Major Wright was one of these) but one of the key features which had attracted OCdt Anthony Butler to select the activity, was its appeal to both utterly inexperienced mountaineers and the most hardened expert climbers. This rests on the minimal equipment required to experience what those in the know call ‘exposure’, but what the layman may term ‘vertigo’. Put simply, one can be extremely close to the edge of a precipitous fall but remain safe. This exhilarating position is allowed through attachment to the ‘via ferrata’ itself; ladders, staples, and wire which can all be clipped onto with a harness, and which has existed in the Brenta region since it was installed during the First World War to aid the movement of troops and supplies through the Alps. After an introductory day walk which allowed the Officer Cadets to become accustomed to the equipment, they began a three day expedition to some of the highest and most exposed points of the Dolomites. OCdt Bullous, a first time mountaineer, said: “It was a whole new world— I didn’t dare let go!” and this echoed the mild peril which anyone must feel as the ladder they descend begins to tilt under an outcrop and well past vertical. The Officer Cadets could achieve this by observing a “mountain light is mountain right” policy, carrying minimal equipment, and staying at Rifugio, which are manned lodges offering accommodation to climbers and hikers at heights of up to 2600m in this area. This added a communal aspect to the experience, as meals are served simultaneously and dormitories can sleep up to thirty people. It was the excellent food provided at these, coupled with some home-made trail mix from England, which fuelled the 50km trek, with ascents and descents adding up to approximately 5km. As well as adventure, AT at Sandhurst is also designed to promote positive leadership characteristics in its Officer Cadets. Physical courage, determination, attention to detail under stress, and excellent communication skills were all required during, and improved by, Exercise Brenta Cadet. The group would like to extend their thanks to Major Wright MBE, the Commandant, Mr Redden, Captain Bagshaw RLC, and of course the Sandhurst Trust, for their help and support throughout the planning and expedition process.